Station Hollywood: Shamshad Begum was the owner of voice like bell of temple. Shamshad Begum was the owner of voice like bell of temple. Shamshad Begum the owner of voice like bell of temple. Shamshad Begum was a legendary singer and the gain of the voice still haunts music lovers. She was born on 14th April, 1919 and died on 23rd April, 2013. She was born in Lahore. From there she came to Mumbai with Mehboob Khan. Her talent was recognized by music director Ghulam Haider in the early 1930s. 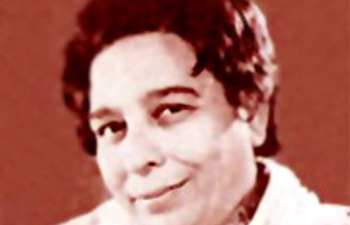 After Naushad Ali became successful he recorded songs with new singers as well in the early 1950s, but kept working with Shamshad in the late 1950s and early 1960s. Naushad Ali chose his favourite singer Begum once again to sing four out of the twelve songs in Mother India. Begum is credited with singing one of the first Westernised songs, "Meri jaan...Sunday ke Sunday" by Ramchandra. She kept getting more offers to sing songs and was the highest paid female singer from 1940 to 1955 and again post Mother India in 1957 to 1964. In 1949, music directors S. Rajeshwara Rao, M. D. Parthasarathy and Balakrishna Kalla asked her to sing "Jaiyo Jaiyo Shipayon Bazar" for P. Bhanumati in the film Nishan, produced by Gemini Films of Madras, which became highly popular. In 1954, when OP Nayyar got a break as a composer, he approached Begum to record songs for Mangu. Nayyar described her voice as resembling a "temple bell" for its clarity of tone. He worked with her until the late 1960s and gave her many hit songs, including "Ab To Jee Hone Laga" from Mr. & Mrs. '55, "Main Jaan Gayi Tujhe" from Howrah Bridge, "Zara Pyar Karle" from Mangu (1954), "Saiyan Teri Ankhon Mein" from 12' O Clock (1957), "Thodasa Dil Lagana" from Musafirkhana, and many others. Incidentally Shamshad Begum sang around 160 duet songs with Rafisahab. Majority of them rocked Bollywood music in the 1950s. Some of the most famous ones included “leke pehela pehela pyar” in film CID composed by OP Nayyar, “thandi hawaye kaalighatayen”, “husnwalen wafa nahin karte” in Love in Simla, composed by Iqbal Qureshi, “mai jaan gayi tujhe saiyan” in Howrah Bridge composed by OP Nayyar, “gao tarane manke” in Aan composed by Naushad Ali, “dhoom dharaka dhoom dharaka” in film Amber, “door koi gaye dhun yeh sunaye” in Baiju Bawra composed by Naushad Ali, “ho bachpan ke din bhula na dena” in Deedar composed by Naushad Ali, “nadi kinare saath hamare” in film Babul composed by Naushad Ali, to name a few. Shamshad Begum had other solo hits like “ek do teen aaja mausam hai rangeen” composed by Shankar Jaikishan in film Awaara in 1951. From the 1970s Shamshad Begum faded away from the industry, but her brilliant bass still haunts the listeners. Happy birthday to Sanjay Dutt. Posto is the biggest hit bengali film of 2017. Happy birthday to dancer actress Aruna Irani. Bappi Lahiri stormed Zee Bangla Mirakkel Program.